It is impossible to speak about Russian literature without taking into account the society in which it was written. This is especially true for the 20th century, when five Russian writers were awarded the Nobel Prize. When the émigré writer Ivan Bunin got it in 1933, the Swedish Academy was reproached for not having awarded the prize to the pro-Soviet Maxim Gorki; Boris Pasternak‘s prize, in 1958, was fiercely attacked by the Soviet authorities as a political, anti-Soviet act; Mikhail Sholokhov‘s, seven years later, was criticized for being, in its turn, a conciliatory gesture toward the Soviet regime; and Aleksandr Solzhenitsyn‘s award (1970) was conceived in the same vein as the prize to Pasternak. Iosif Brodskiy photographed by his father, Alexandr Brodskiy, on the balcony of their apartment in Leningrad in 1958. When Joseph Brodsky was awarded the Nobel Prize in 1987, times were changing. 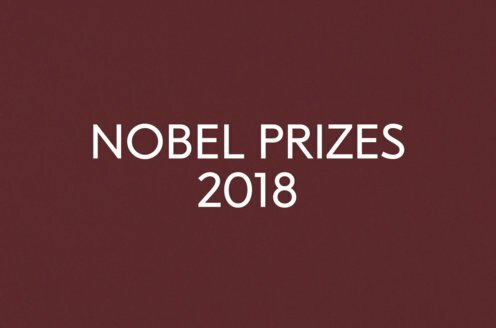 The Soviet Union was opening up, but the authorities were still not able to cope with the fact that a Russian writer had got the prize, and it was announced with great delay. 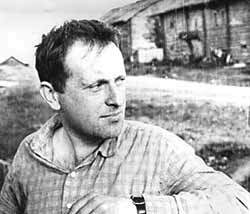 Iosif Brodskiy was born in Leningrad in 1940 and died in New York in 1996 as Joseph Brodsky. Between the two spellings of his name lies one of the more dramatic human and poetic destinies in 20th century Russia – a country rich in drama. Iosif Brodskiy grew up in the Soviet Union, first during the Stalinist era, then under the milder political climate of Khrushchev and Brezhnev. He started to write poetry at the end of the 1950s, but like everybody else who refused to accept the Soviet aesthetic norms he encountered great difficulties and could only publish a few poems. Brodskiy revolutionised Russian poetry by introducing themes that were taboo in the Soviet Union, first of all metaphysical and Biblical ones. And he did it in a verse that was both innovative and exceptionally varied. Influenced by his Russian 18th century precursors (first of all Derzhavin), as well as by Polish poets (Galczynski, Norwid) and the English Metaphysicals (Donne, Herbert, Marvell), Brodskiy enriched Russian literature with a new ironic sensibility. The conspicuous use of literary reminiscences and allusions could perhaps be seen as a result of his growing up in almost total cultural isolation, where every alternative voice was eagerly absorbed. In the Soviet Union such things did not go unpunished. The young poet was regarded as a rebel and a parasite: he was arrested and, after a parody of a trial, in 1964 exiled to northern Russia to think better of it. This he did, but not in the way the authorities had wished. During his exile he developed his poetic technique and ripened as a poet. And thanks to protests from Soviet and Western intellectuals, he was set free in 1965, before the end of his term. He returned to his hometown, Leningrad, where he stayed until he was sent into foreign exile in 1972 – this time without trial and for good. He settled in the USA, where he became Joseph Brodsky, an American citizen, and where he lived until his death twenty-four years later. Brodskiy during his exile in Northern Russia. 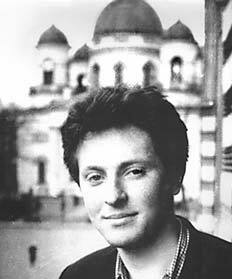 In the USA, Brodsky continued to write poetry in Russian, and also translated many of his poems into English. If he never reached the same poetic peaks in English as in Russian, he developed instead into a brilliant essayist in English. As a writer Brodsky thus had two identities, and it was in his capacity as one of the greatest Russian poets of the 20th century and a major essayist in the English language that he was acclaimed by the Swedish Academy in 1987 for his “all-embracing authorship, imbued with clarity of thought and poetic intensity”. His first collection of essays, Less Than One, was published in 1986. Some of the best essays were devoted to his great predecessors in Russian poetry – Osip Mandelstam, Anna Akhmatova, and Marina Tsvetayeva. In an essay on Tsvetayeva, Brodsky formulates his view of the poet as a “combination of an instrument and a human being in one person, with the former gradually taking over the latter”. 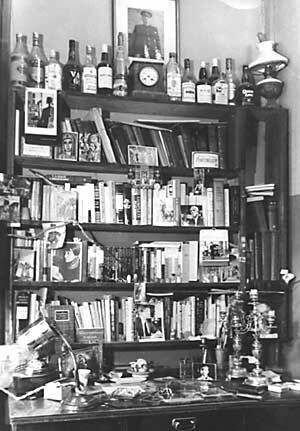 Brodskiy’s study photographed on June 4, 1972, the same day he was exiled from the Soviet Union. The poet, transformed gradually into an instrument for his poetic gift, has no choice – and the recognition of this exclusiveness determines his path. By constantly listening to his own voice, constantly developing his language, constantly taking the next stylistic step, he becomes more and more isolated. Brodsky’s words about Tsvetayeva are a self-characterisation. Brodsky the poet is led farther and farther away from the literary mainstream by language itself. And Brodsky the man, grown up in a society with whose values he cannot reconcile himself and which refuses to accept him, is, like Tsvetayeva and Mandelstam, forced into a growing social alienation. The exile to northern Russia and his expatriation eight years later are but outer confirmations of an inner process that in other countries would have taken less dramatic turns. In the poem “Lullaby of Cape Cod” (1975), Brodsky describes his “move” to the USA as a “change of Empire”. However shattering this experience may be, it changes nothing in essence. Empires have always existed and resemble one another, if not in detail (one empire can, of course, be more repugnant than the other), then at least in structure – and as regards man’s place in this structure. Although Brodsky was heavily marked by his Soviet experience, he had no illusions about other political systems being able to provide a perfect alternative. The big enemy is not space but time. Time clings to man, who grows older, dies and turns into “dust” – “time’s flesh”, as Brodsky calls it. Key words in his poetry are “splinter”, “shard”, “fragment”. One of his books of poetry is called A Part of Speech. Man – in particular, a poet – is a part of a language that is older than he and will live on after time has settled the account with language’s servant. there is no entry, no proper sum. There are always six bridges spanning the sluggish river. or pen pressed paper with real fervor. There are arcades, colonnades, iron idols that blur your lens. speak in the tongue of a man who’s departed thence. 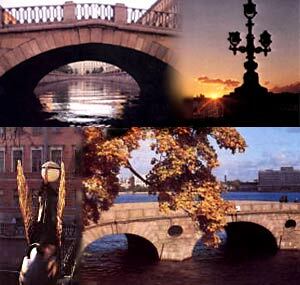 Bridges in St. Petersburg (clockwise): Troitsky Bridge, Prachechny Bridge, Bankovsky Bridge, Kamenny Bridge. The individual’s journey in time and space is matched by a similar development toward non-existence on the historic plane. Not so much because of the threat of atomic bombs or other acts of war but because societies and civilisations are subject to the same “time war” as the individual. To Brodsky, the big threat comes from the demographic changes leading to the peril of Western, that is, individual-based, civilisation. A recurring theme is the diminishing role of the Christian world – to Brodsky, as to Osip Mandelstam, “Christianity” is first and foremost a question of civilisation – in favour of the “anti-individualistic pathos of an overpopulated world”. Thus the individual’s future merges with the world’s: the death of the individual with that of individualism. I don’t know anymore what earth will nurse my carcass. Scratch on, my pen: let’s mark the white the way it marks us. as long as the whiteness lasts. And after. Brodsky’s belief in the power of the word must be seen against his view of time and space. Literature is superior to society – and to the writer himself. The idea that it is not the language but the poet who is the instrument is, as we have seen, at the core of Brodsky’s poetics. Language is older than society and, naturally, older than the poet, and it is language that keeps nations together when “the centre cannot hold” (with Yeats‘s words). 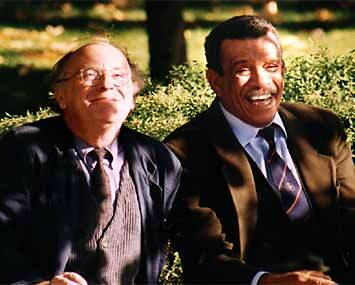 Joseph Brodsky (left) and fellow Nobel Prize Laureate Derek Walcott in the park of Alfred Nobel’s home at Björkborn, Sweden, 1993. Language, in other words, is superior not only to society and the poet but to time itself. Time “worships language” and is thus “lesser” than it. There is a strain of a romantic fatalism in this assertion, but in Russia, a country where people, in Pushkin’s words, are always “mute”, the writer has always occupied a unique position. This emphasis on the dominance of language is thus not an expression of aestheticism; in a society where language is nationalised, where language is political even when it does not speak of politics, the word possesses an enormous explosive force. In Brodsky’s aesthetical hierarchy, poetry occupies the first place. “The concept of equality is extrinsic to the nature of art, and the thinking of any man of letters is hierarchical. Within this hierarchy, poetry occupies a higher position than prose…” This does not mean that poetry is “better” than prose but is a logical conclusion of Brodsky’s view of the hierarchy Language-Time-Space. Time is greater than space, but language is greater than time. To write is essentially to try to “regain” or “hold back” time, and for this purpose the poet has at his disposal means that the prose-writer lacks: meter and caesuras, syntactic pauses, stressed and unstressed syllables. An important means of restructuring and holding back time is rhyme, which refers back but also creates expectation, that is, future. “Song is, after all, restructured time”, says Brodsky (in his essay on Osip Mandelstam), or simply, speaking of Auden, “a repository of time”. And if language lives by the poet, does then not “time” live by the poet, in his poems? on, blisters eyeballs; the same goes for vocal cords. My voice may be muffled but, I should hope, not nagging. as Little Red Riding Hood didn’t mutter to her gray partner. The poet’s voice, “more muffled than the bird’s, but more sonorous than the pike’s”, as it is characterised in the poem “Comments from a Fern” (1989), is so subdued that it almost erases the difference between sound and silence, and so close to time’s rhythm one can get – a rhythm that the poet can approximate with the help of meter. When Brodsky stresses the importance of classical forms, he is not just being conservative; he does it with a belief in their double function as a structuring element and upholder of civilisation; the assertion of the absolute value of these stylistic means are thus not primarily a question of form but an important part of what could be called Brodsky’s philosophy of culture. Joseph Brodsky wrote poetry for the better part of his life, and the history of his publications is a reflection of the political system he grew up in. His first books were selections from his poetry published by friends and admirers in the West and were forbidden reading in his home country. In the Soviet Union, his first book was published only after the Nobel Prize. A full-scale publication of his works, including Russian translations of his essays, was made possible only after the fall of the Communist dictatorship in 1991. 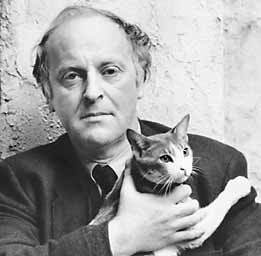 Brodsky with his cat Mississippi, New York, November 1987. One consequence of Brodsky’s idea that a person moves only in one direction – from – was that he never went back to his homeland. His thinking – and acting – was linear. From the age of thirty-two he was a “nomad” – a Virgilian hero, doomed never to return home. * Bengt Jangfeldt has been specializing in Russian literature for 30 years. His doctoral thesis (1976) treated the relationship between the Soviet State and the literary avant-garde during the years of the revolution, 1917-1921. This work was later supplemented by a series of archival editions. Professor Jangfeldt has collected and published the correspondence between Vladimir Mayakovsky and Lili Brik (in Russian in 1982 and 1991, in English in 1986: “Love is the Heart of Everything”) as well as the literary legacy of the great Russian linguist, Roman Jakobson (Russian edition 1992, English edition 1997: “My Futurist Years”). During the last ten years he has been focusing on the historical ties between Sweden and the St. Petersburg region. This work has resulted in several books, including Svenska vägar till S:t Petersburg which in 1998 was awarded the August Prize (the Swedish equivalent of the Booker Prize). His last books include an authorised biography of the Swedish author and doctor Axel Munthe (En osalig ande, 2003). Bengt Jangfeldt has translated many of Joseph Brodsky’s works into Swedish, the poetry from Russian and the prose from English. In 1988, he was awarded the Letterstedt Prize for Translation by the Royal Swedish Academy of Sciences for rendering into Swedish Brodsky’s book of essays, “Less Than One”.